KK NULL (real name : KAZUYUKI KISHINO) was born in Tokyo, Japan. Composer, guitarist, singer, mastermind of ZENI GEVA. One of the top names in Japanese noise music and in a larger context, one of the great cult artists in experimental music since the early 80’s. 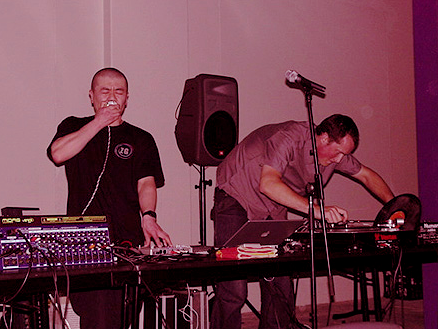 All the while, KK NULL has worked on his solo career and collaborated with other musical innovators such as Z’EV, CHRIS WATSON, KEIJI HAINO, JON ROSE, MATMOS, FRED FRITH to name a few, and has been invited to perform at international festivals such as “Presences Électronique” in Paris (France), “Sonar” in Barcelona (Spain), “All Tomorrow’s Parties UK“, “Radar” in Mexico City (Mexico), “International Sound Art Festival” in Mexico City (Mexico), “Sergey Kuryokhin International Festival (SKIF-6 & 8)” in St.Petersburg & Moscow (Russia), “Elevate” in Graz (Austria), “X-peripheria” in Budapest (Hungary), “Liquid Architecture” in Sydney, Melbourne, Brisbane (Australia), “Totally Huge New Music Festival” in Perth (Australia), “Avanto Helsinki Media Art Festival” in Helsinki (Finland), “Roadburn” in Tilburg (Holland), “International Festival Musique Actuelle” in Victoriaville (Canada), “Electron” in Geneve (Switzerland), and more. After playing the guitar as his main instrument for nearly thirty years, KK NULL has gradually moved towards a more electronic approach. Since the late 90’s he has concentrated his efforts on his solo & collaborative recordings, exploring the outer territories of electronica, creating intense clashing wave of noise, structured electro-acoustic ambience, broken down rhythmics, scattered pitch sculptures, droning isolationist material which could be described “cosmic noise maximal/minimalism”.